The first order of framing is of course what we point the camera at. What gets included and excluded plays an enormous role in the meaning that is transmitted through the image. One of my favourite images to demonstrate this is Weegee’s “The Critic”. Taken in 1943, the image depicts a ‘bag-woman’ supposedly criticising two overdressed socialites as they walk past her. The more commonly viewed image shows the crop of just the bag woman and the two socialites. In this crop the meaning is fairly obvious. However, the less frequently viewed original image shows other people on the left of the frame who the bag woman may actually be talking to (the man is possibly Weegee’s assistant who assisted in the staging of this image). What is included or excluded from the frame is critical to the reading of the image. There is an interesting side effect of the act of framing that John Szarkowski picks up on: “To quote out of context is the essence of the photographers craft” (The Photographers Eye 70:1966). Kevin Carter’s iconic image of the Sudanese girl and vulture is a perfect example here. What we see though the image and what the reality are often two different things entirely! “A visually literate viewer assumes that the entire content of the frame to be intended by the photographer” (Farris Belt 7:2008). The photographer needs to be consciously aware of what goes in and what stays out of frame. Cropping, is the post-capture act of refining the framing of the image, and as such helps the photographer eliminate the elements that serve to distract the viewer from the intended meaning of the image. Sometimes it helps to shoot loose and crop later (photographing sport and wildlife comes to mind immediately), but the awareness of a future crop should still be a part of the intended creation of the image. This is particularly the case when we intend to change the final format of the captured image. Our eyes view images within the context of the frame. This is an important consideration as the edges of the photograph are the first order of the design of the image (the composition). In this way our eyes automatically pan across a panoramic format image. 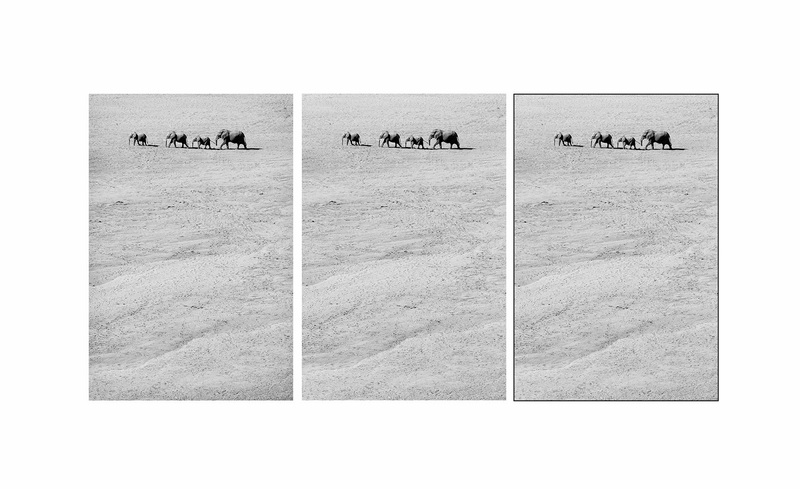 We unconsciously look toward the centre of a square format frame and seem to subconsciously yearn for third or diagonal balance in 2:3 ratio frames. This brings us back to Farris Belt’s comment regarding the photographic frame. The edges of the photograph take on an active role in the way that the image is read. The images above are all slightly different. The image on the left has a very faint vignette to it, while the central image lacks the vignette. The right hand image is identical to the central image, but has a thin black border to it. The subtle differences play an active role in the reading of the image. 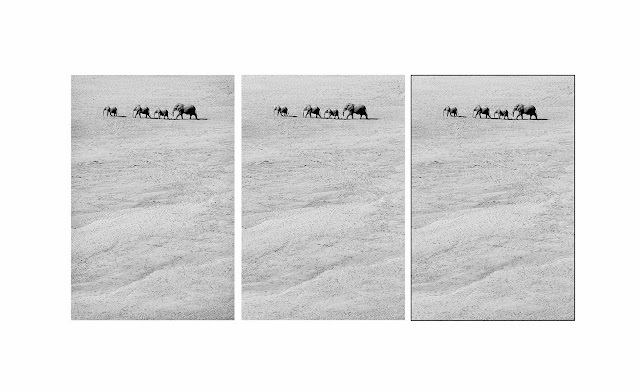 In the left image, the vignette forces the eye into the frame so the viewer concentrates more on the elephants. The central image has no vignette and as a result the eye wanders outwards towards the bright edges of the image, giving the impression of a greater space - possibly similar to that depicted - outside of the actual image. The right image encapsulates the viewer’s eye within the black frame, precluding any thought of a world outside of the framed image. Personally, I find it difficult to decide between the first two images as to which works more effectively, but each certainly has a subtly different reading to that of the other. The basic premise in action here is the difference between active and passive frames. An active frame is one which stops the viewer’s eye from wandering outside of the confines of the image space. 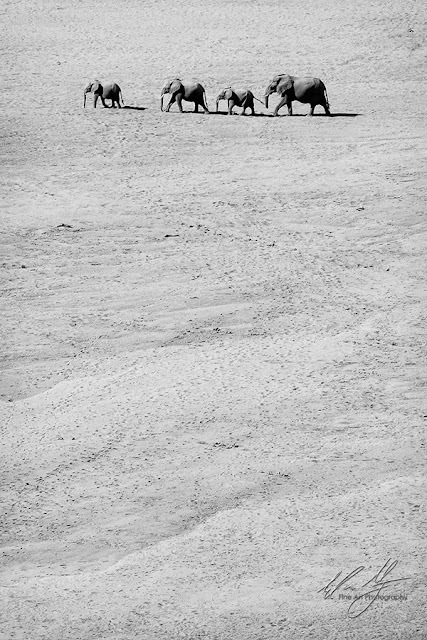 A passive frame on the other hand tends to imply that there is space beyond the borders of the image. These are simple post-production techniques which play a large part in the ultimate meaning of the image. Bearing these in mind while actively framing the image in camera could potentially change the way the photographer creates the image. Photographic composition can be greatly improved through recognition of the frame as an integral part of the design of the image. The camera is able to encapsulate the world in a single frame, but that frame does more than simply border the content of the image. The frame plays a didactic role in converting the content of the image into a meaningful subject.